It’s no secret that mobile aids business growth, research by Nucleus Research found that sales reps saw their productivity increase by 14.6% when adding mobile access to CRM applications. With a mobile CRM you can easily access your most important leads and customers while you’re on the move. 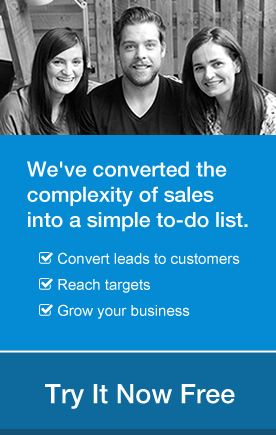 After all, it’s your sales contacts at your fingertips, what’s not to like! Our dedicated iOS and Android developers have been working hard on updates to the mobile apps over the last few months. We’ve rounded up our favorite mobile updates in case you missed them! 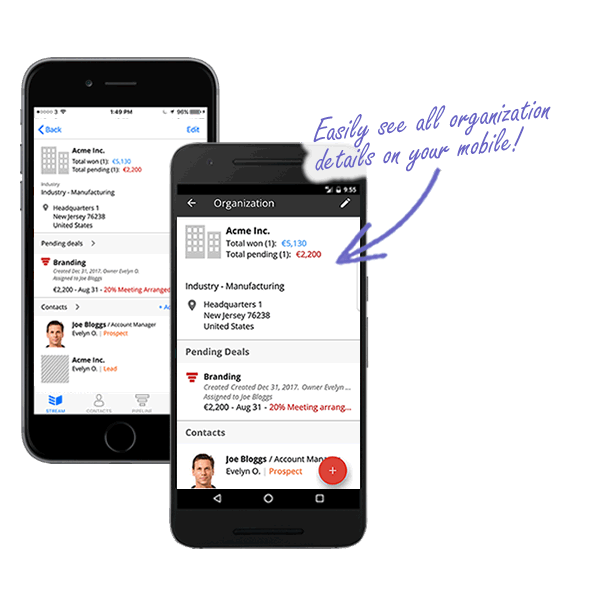 You now have more organization details at hand from your mobile app. The updated organization view now includes details like description, phone, URL, address plus any custom fields, a deal summary, pending deals, along with a list of contacts and linked contacts. In addition it’s easy to add, import or link a contact to a company from your iOS or Android device. Prior to using a CRM, your address book on your phone could’ve doubled up as your CRM – allowing you to store new leads. However, there was no easy way to set follow up’s / reminders. 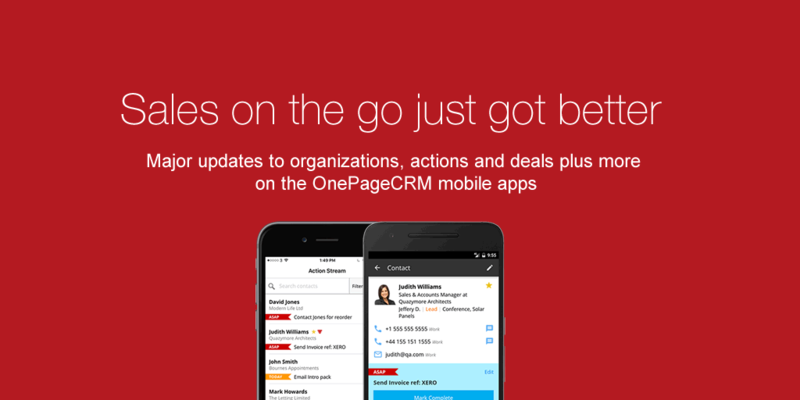 OnePageCRM’s mobile apps now make it painless for you to transfer these contacts to your CRM. Simply click ‘add a contact’ and import from address book! Simple. For iOS users, you have the ability to import in bulk. Now all your leads, prospects and customers are stored in one place and still accessible from your mobile. It’s really hotting up for iOS users! You can now clone a contact in organization view and it’ll inherit existing organization details leaving the contact fields empty so you can add your new contact details. No need to waste time copy and pasting! Nice ehh? Complete picture: Easily see the full picture of the details associated with the organization right from the mobile app. Reduce admin: Quickly create a contact from your address book in one click. As many of you who are already familiar with OnePageCRM will know, we focus you 100% on taking action! When your on the go why should this be any different? Updates to Actions means the mobile apps look and feel like the desktop app even more! You now have the ability to see Queued Actions and Actions with dates on both iOS and Android. Next Actions are the only ones which appear in your Action Stream. The ability to add more than one action to a contact allows you to easily schedule follow up’s for the future after important calls/meetings, ensuring you don’t miss out. 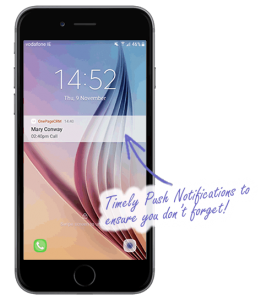 Another powerful addition to the mobile apps are Push notifications; pop up reminders that appear on your screen when your next actions fall due, ideal for those time-sensitive tasks. Push notifications will ensure you never drop the ball on following up with your leads, prospects and customers. Timely reminders ensure you don’t miss out: Push notifications ensure you don’t miss out on upcoming calls or meetings by sending you helpful reminders at just the right time. Stay Organized: Queued actions allow you to easily see what’s the next action you need to take with your prospect. Deals just got a lot swifter! In both OnePageCRM’s iOS and Android apps, you have the ability to quickly edit deals, upload, download and delete attachments. Your time on the go just got more efficient! In the OnePageCRM desktop app, you can add custom fields to deals eg. Product type, invoice number etc. With our latest update, you can now view and edit these custom fields on your mobile making it a breeze when updating contact details on the go. OnePageCRM has its own love affair! Our swipe functionality on iOS devices means you can remove those dead deals, or unwanted notes and keep a clean and uncluttered database. Simply swipe left to delete a deal, a note or a call! 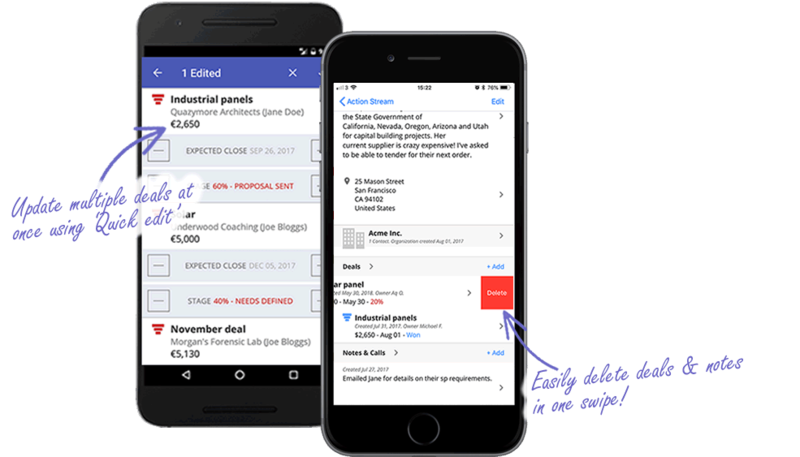 Speed is important when sales reps are on the road, wasting time in their CRM is not ideal that’s why we’ve added ‘Quick edit’ to our mobile apps. When in the Pipeline you can edit multiple deals at once, this is particularly convenient if you’ve had a couple of meetings or calls back to back! Get work done faster: Easily edit deals from your mobile device saving you time when you get back to the office. Better contact management: You can now upload attachments to your deals making it easier to have all your data in the one place. Quickly delete deals: Delete deals in one swipe! No need to wait until you get back to the office. What’s more, is it’s even easier to login to OnePageCRM on your mobile with new ‘Sign in with Google’ option on both iOS and Android. Why not download our iOS or Android apps today and get the full OnePageCRM experience while on the road! We’re here to help. We’ve added a dedicated section for video tutorials so you can access them easily. Check it out for yourself! We’d also love to hear your feedback so feel free to hit ‘contact us’ right from within the app and we’d be happy to review your suggestions or questions! And of course, if you like what we’re doing and want to tell your friends, there’s an option to share/rate us on Google Play and the App store.